My little girl isn't into dollhouses yet... and who knows if she ever will be!? But I appreciate their intricate nature and am such a fan of those who make them by hand from green materials. If you're looking for a winter indoor project -- perhaps a way of bonding with one of your older kids by making this a joint endeavor -- here are two beyond darling dollhouse ideas you can make yourself! 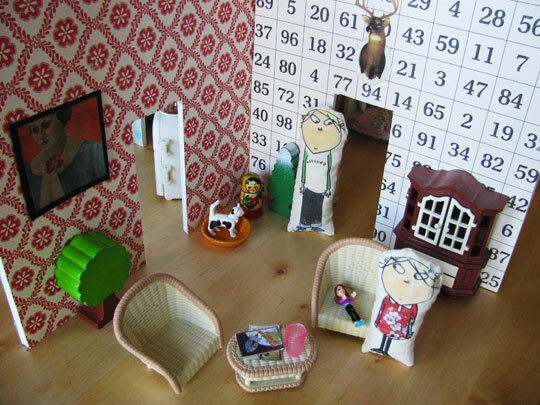 Above: This dollhouse was created by the mom behind Darlybird. She shares the details behind the making of and the magical outcome here. Below: Amy of Sweet Sweet Life made this dollhouse with her daughter. Click here for the tutorial, and see more amazing photos of the completed dollhouse here. These dollhouses make me wish I was a kid again!